The Federal Home Loan Bank of Dallas (FHLB Dallas) awarded a $68,469 Affordable Housing Program (AHP) grant to the Fuller Center of Webster, Inc. to construct new homes for seven very low- to low-income families currently living in substandard conditions. Funding was made available through Citizens Bank & Trust Company in Springhill, Louisiana. The Fuller Center is a partnership program that works with very low-income and low-income homebuyers to construct adequate housing. 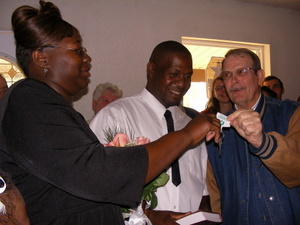 For 16 years, the Fuller Center was an affiliate of Habitat for Humanity, but became a Covenant Partner of The Fuller Center for Housing in 2007. Charlie Park, Executive Director of the Fuller Center of Webster, said that the Fuller Center of Webster buys the materials, assists with the construction along with the homebuyer and volunteers, then sells the house to the homeowner for exactly what it cost to build with a no-interest mortgage and no profit. Learn more about the Fuller Center of Webster here.